Thanks to a question asked by Ben, I thought of posting this write-up; MS Project 2010 has 32 bit color, so it has rich set of new and mesmerizing color set in its font color option which include Orange and variables shaded of blue and green. While MS Project 2007 has 16 bit color, so saving a 2010 font formatted file have impact when opened in 2007. 1. Orange could change to Red, lighter shades of Blue can turn to hyperlink blue etc. Implying that newer shaded of 2010 changes to some nearby shades in 2007. 2. Strike through tasks are not deleted in 2007, but strike through is removed. 3. Inactive tasks are deleted. 4. Manually scheduled tasks become Auto, as well constrains are set on them to trace their manual start or finish dates. When you convert a Project 2007 file to a Project 2010 file, Project will operate in fully functional mode and not in compatibility mode. However, Project’s default behavior for new tasks will differ from new files that are created in Project 2010. 1. Existing Tasks of 2007 will remain to Auto mode in 2010. 2. New tasks created would be in Auto mode by defualt, unless changed to manual. 3. Task Mode column won’t be displayed by default and need to be inserted. 4. Master Project, displays with full functionality, but only those subprojects which are converted to 2010 would expand rest won’t. 5. Cross-project links from Project files that have not been converted to Project 2010 and that are contained within a file that has been converted to Project 2010 cannot be expanded. Cross-project links that are converted to Project 2010 can be expanded. 6. Resource Pool using projects when converted to 2010 would need Resource Pool also to be converted to 2010. 7. Fields used in Formula in 2007 would change to its equivalent fields in 2010. Will list more points, as I come across, these are some very top level observations. Please connect with us for free online over-view of MS Project 2010 /Project Server 2010. Based on the number of participants, The session’s dates will be announced soon, please leave us your contact and mail ID for further communication, in order for us to send you over the live meeting link. When you apply updates on a completed task that does not have an actual start date, task scheduling fails in Project Server 2010. Assume that you first set a large value for the actual work on a material assignment in Project Server 2010. Then, youreduce the value. In this case, the actual work is saved incorrectly for the material resource. Assume that you click Send to submit a timesheet in Project Server 2010. You click Send again when the timesheet is being processed in the queue. In this case, a TimesheetIncorrectMode error occurs. 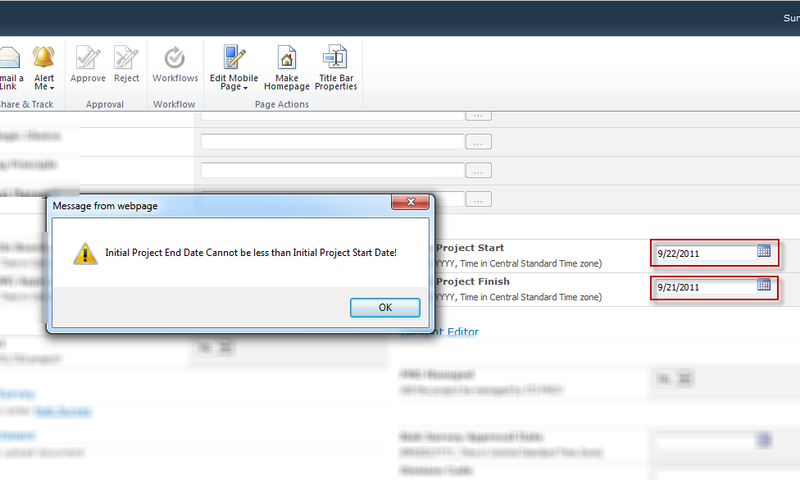 Task scheduling fails in Project Server 2010 if a project contains links to tasks that do not exist. You have a project that has a material resource. The material resource is assigned to a task. The material resource has no cost. The cost accrual is set to the start of the assignment. In this scenario, task scheduling fails in Project Server 2010. The scheduling feature changes a task’s start date to an earlier date under certain conditions. This issue may cause task scheduling to fail in Project Server 2010. Assume that you open a timesheet for a future period of time. Then, you click Save. In this case, additional lines are added into the timesheet. When a project manager makes a change to an assignment in Project Server 2010, resources receive an email message notification even if the assignment is completed. The reporting database update job fails in Project Server 2010. Therefore, other jobs that are marked with “waiting to be processed” that follow the update job in the queue are auto canceled. When you click the This is an Enterprise Project. Click this icon to open the Project for editing in Project Professional icon to open a project in read/write mode in the Project Center, the project opens in read-only mode.